To build a mobile site or not to build a mobile site; this is a question at the forefront of many a discussion. 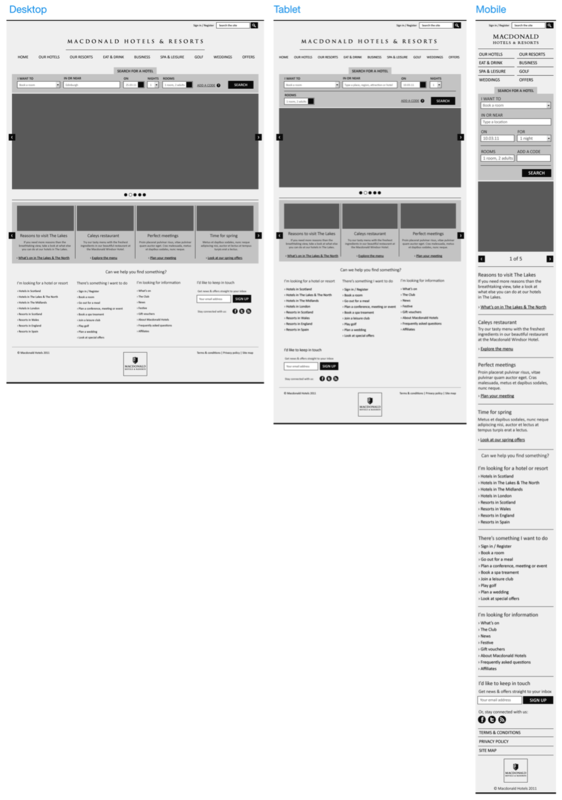 There is, however, another option: responsive web design. When, why, and how should you go about designing a responsive website? There are many options to consider when a client asks for a mobile solution for their website, and the suitability of these options depend on the business requirements and budget; it’s also important to consider any existing solutions or sites they already have. Creating a responsive website isn’t a complete mobile strategy, and won’t answer every brief, but, especially if you are starting a website from scratch, you should consider it as a very serious option. So why would you decide to create a website this way? 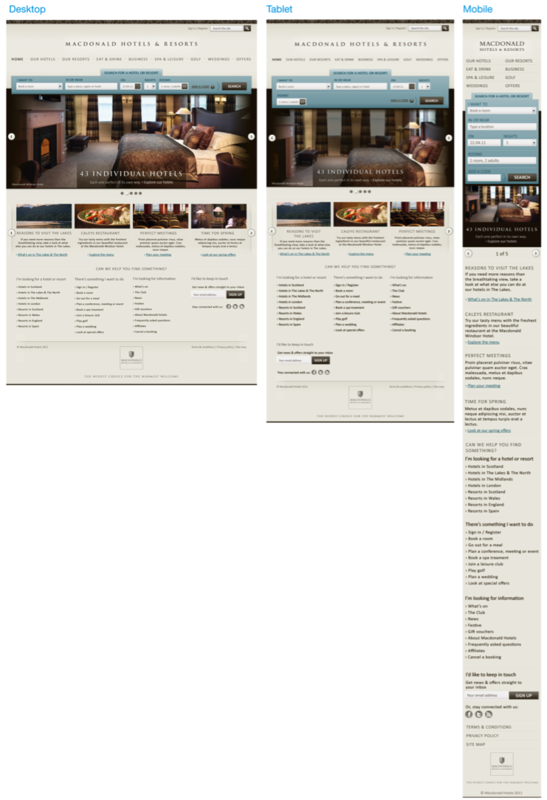 Let’s talk through the process of creating a responsive website using a hotel website example. This last September, Equator released the new Macdonald Hotels website. Macdonald Hotels are a UK hotel chain with 47 hotels and resorts across the UK and Spain. We created the new site for them that included a new site structure, extensive hotel content, and a new booking engine. Here are the steps we went through and also some considerations you should think about when designing a responsive website. Research is always a very important stage in the design process so it’s worth putting a little extra consideration into the people who will be using different devices. Understanding how these different users may want to use the website on a variety of devices will help you to decide what the priorities are on the project. Questions like this are starting to become more redundant. In the past we’ve assumed that mobile users have been task-driven, e.g. I want to get the hotel’s address; I want to book something quickly. But now people on any device are just as likely to leisurely browse the Internet as they are to need to complete a task quickly. It is worth considering though, as thinking about users’ goals in this way could help you prioritize content for the site, irrelevant of what device the visitor is using. The logic behind how the styles should change can be a bit hard to define and the magic of it will really come out in the build of the site, but we need a way to start defining the different width stages of the layout. We choose to look at 3 screen widths, a desktop, iPad and iPhone. We felt these covered what our requirements were, but for your project you should consider what widths are important for you to think about—you may even need to look at bigger screen widths for TV internet usage. At this point of the project you should already the key templates that you’ll need to wireframe, but you shouldn’t need wireframes for all these templates in the different widths. The main goal here is to help define the logic behind how the CSS will change the look of the page, so focus on pages that have very different layouts. For us we looked at the home page, all the booking process pages, the hotel pages, offer pages as well as some generic layouts. Each of these covered our different column layouts, content types and key functionality. As you create each wireframe you’ll need to think about the columns and how the components within these will adapt as the page width shrinks&mdashe.g. what happens When you have less space? If you have four columns of content? When you change to a three-column width? There should always be ongoing communication between the designer and the front end developer to answer any issues about what you can do with components visually and in the CSS. Other header components are aligned right and would just shift along as the page width reduced. Remember when you are styling the navigation to think how it will work as the screen sizes changes. Certain styles, such as using tabs, may be difficult to get to work and look good as the screen width reduces. Our footer is pretty simple, just think about what content you want and how it will change as the width changes and the columns reduce—this could be as simple as components wrapping underneath each other. As soon as you have created your first wireframe test it on the relevant device straight away. It’s easy to get the image on a simple web page and take a look at how it looks and feels to scroll down. This will let you know early on if your wireframe is working. Testing in this way gave us clues really early on what was and wasn’t working. If you look at this wireframe you should quickly see our first issue. As the user navigated through the site they would only see these first two page elements&mdashthe navigation and the search panel. This means that the user may be unsure if the page has changed, as well as where they actually are on the site. This was solved simply by putting these items in show/hide panels—letting the user get into the content much faster. Adding the tablet and mobile versions to your user testing process will give you a lot of useful feedback too. Now that your wireframes are created, tested, amended and approved it’s time to make them look good for all your screen widths. 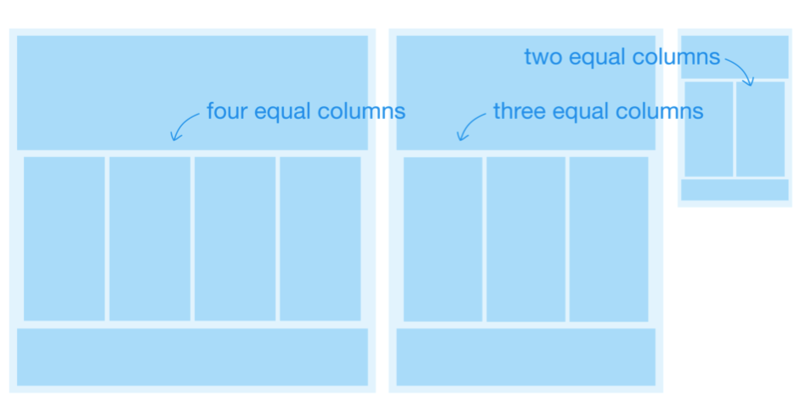 It isn’t necessary to create visuals for every wireframe. The main objective is to cover all the styles that will be required to create the HTML and CSS. There will be a little bit of a crossover for wireframes and visuals, some styles that will be required for the mobile where there wasn’t a need for an initial wireframe. Styling the page: Think about keeping your styles simpler for your mobile version—what’s great about CSS3 is that you don’t need lots of images to get great styled effects, but these still take a bit of time to load. Thinking about font: Make sure your font sizes are going to be readable on each device. They’ll have to be much larger on the mobile device to ensure readability. Also, be prepared for your visuals to change when it gets translated into the build of the site. There always should still be balance between what looks good on a flat visual and what will work when the site is being developed. The final site isn’t too far away from our look and feel visuals, take a look here and you can compare with the live site. Building the HTML and CSS is a challenge all of its own, so I won’t discuss this is much detail, but here are a few things to think about. It’s important to get the client behind the idea of using advanced CSS styles, allowing the site styles to degrade as the browser capability does. This lets you keep site loading times low. Constant communication is required: The project will always go smoother if the team speak to each other, so from both designer and developer it’s good to discuss problems and solutions as soon as they turn up. 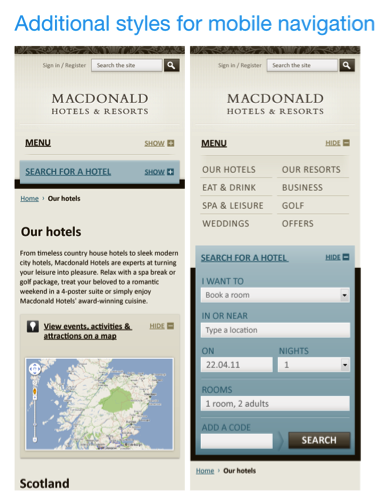 It’s worth taking a look at our front end developer Jamie Boyd’s take on the front end development of the Macdonald Hotels website for responsive design. If you are thinking about convincing your client to have their new site designed and developed in a responsive way, firstly you should consider if it really is the right solution for them, then you’ll need to be able to persuade them of the benefits and communicate that it will add more time to the project. But, I do believe that this is how more sites will be developed in the future. We’ve all learned so much on this project about developing a responsive website. We were lucky to have a client who was as keen as us to create something new and innovative and from that we’ve created a site we’re all proud of. Image on UX Booth homepage from needoptic on Flickr.